Highest grade smokeless needle moxa from Seirin Japan. Moxsafe consists of a lightweight stainless steel holder that houses a cylinder of ultra-pure carbonized mugwort. 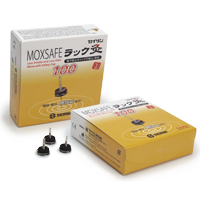 Designed to fit on Japanese and Korean style acupuncture needles, Moxsafe’s holder prevents moxa ash from falling on the patient. Moxsafe is easy to use, odorless, safe and smokeless. Box includes 6 stainless steel holders and 100 pieces of smokeless moxa.